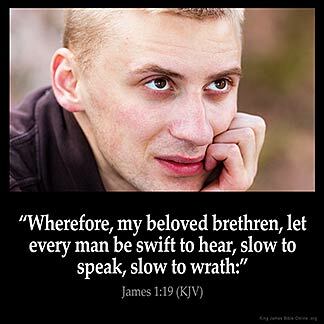 JAMES 1:19 KJV "Wherefore, my beloved brethren, let every man be swift to hear, slow to speak, slow to wrath:"
16Do not err, my beloved brethren. 17Every good gift and every perfect gift is from above, and cometh down from the Father of lights, with whom is no variableness, neither shadow of turning. 18Of his own will begat he us with the word of truth, that we should be a kind of firstfruits of his creatures. 19Wherefore, my beloved brethren, let every man be swift to hear, slow to speak, slow to wrath: 20For the wrath of man worketh not the righteousness of God. 21Wherefore lay apart all filthiness and superfluity of naughtiness, and receive with meekness the engrafted word, which is able to save your souls. 22But be ye doers of the word, and not hearers only, deceiving your own selves. Wherefore my beloued brethren, let euery man bee swift to heare, slow to speake, slow to wrath. You know this, my dearly-loved brethren. But let every one be quick to hear, slow to speak, and slow to be angry. 1:19 Let every man be swift to hear - This is treated of from #Jas 1:21 to the end of the next chapter|. Slow to speak - Which is treated of in he third chapter. Slow to wrath - Neither murmuring at God, nor angry at his neighbour. This is treated of in the third, and throughout the fourth and fifth chapters. Jas 1:19 Let every man be swift to hear, slow to speak, slow to wrath. Let each saint hear and learn, but be careful not to speak rashly, and especially in anger. this verse has meaning, but it is unfortunate that many would not heed these words and create peace. May we dream and aspire a new world for us to be free. Good verse. fast to hear, slow to talk and slow to wrath. I must be quick to hear and slow to speak : slow to wrath : I need to put a bit in my mouth at times. I sometimes think I speak out of wanting to tell my way instead of listening to others. If I am slow to speak then I understand that I will be slow to wrath to be very angry . I must : Stop : Look and : Listen to Holy Spirit within me. I am still learning to do this and probably will be learning to do this till I die or when Jesus returns.